I’m writing this series of posts because I love food, traveling, and learning about other cultures through food. Slovakia is probably the country that I know the least about. I will only be there for just under 24 hours so I have a very limited amount of time. Lunch: Like Prague, Slovakia has goulash and dumplings as a popular dish. Zeleny Rodrigez is said to have excellent goulash, it is ranked #3 on Tripadvisor, and it is supposed to be on the way to the castle! Dinner: According to Wikitravel, the one dish that you cannot leave Slovakia without trying is: “Bryndzové halušky [which] is a Slovak national dish made out of potato dumplings and special kind of unpasteurized fermented sheep cheese called ‘bryndza’.” The Slovak Pub looks like a good place to try this classic dish. Snack: Wine is a snack right? There are quite a few calories in it after all! haha. I want to drink a glass of wine at the fancy UFO restaurant for fabulous views of the city lit up at night. I would also like to try some pirogis if they are available. Breakfast: I will have to grab something quickly on the way to the train station or eat in the hostel. Ideas? 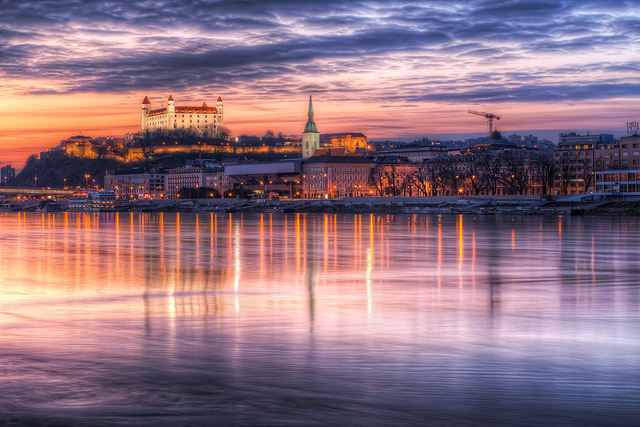 Has anyone been to Bratislava? It is not a country that I have read much about, so I would love tips for any restaurants and/or foods that you think I shouldn’t miss. What an inspiring sunset photo. I hope to be able to take a similar one when I get there next week!